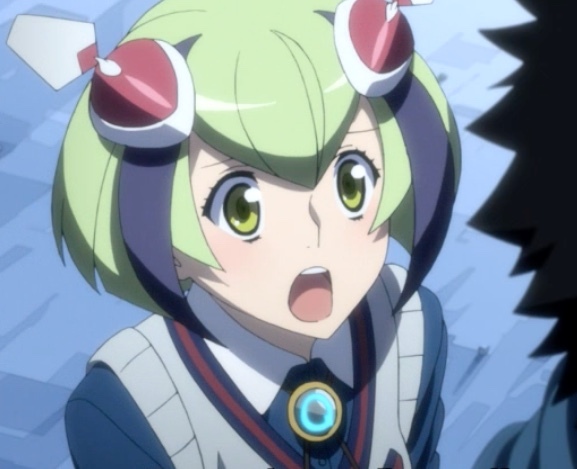 In Dimension W episode 11, titled The Lost Genesis, Kyōma Mabuchi watches Mabuchi swipe the Genesis coil, but he forgets where he put it. Loser grabs a fifth numbered core but can’t see where Mabuchi put the Genesis coil. Mira Yurizaki continues gentle and supportive of everyone in sight. And the entire cast demonstrates a complete lack of awareness about motivating others. Loser defeats Jason Chrysler and takes his numbered coil, bringing Loser’s total to 5. He and Elizabeth Greenhough Smith head for the center of the disturbance. Ruwai Aura Tibesti tells Mabuchi that he survived the attacks because he has multiple bodies. What remains of his living body, including his brain, is linked to a Dimension W-enabled network that lets him control these multiple bodies with no lag. Ruwai’s worried that Mabuchi will hate him, but the Grendel reassures him. Salbe and Mabuchi are now besties. Capture from the Funimation stream. Yurizaki tells Ruwai about the device that had been keeping Mabuchi unconscious. Another of Ruwai’s artificial bodies awakens Salba Ene Tibesti, Lashiti, and the others at the cabin. Along with Scorpion Cat Cassidy, the cabin team meets up with Mabuchi and his group near the center of the devastation. Somehow, Mabuchi and Salba are now trusting friends. Apparently, Mabuchi had seen enough of Salba’s memories to know the older brother was honestly trying to help his little brother, and that scored points with Mabuchi. They approach one of many doors to Adrastea, and this one seems to be glowing with special brightness. Salba confesses that he’s after the Genesis Coil that can create possibility out of nothing. He wants to use it to restore Ruwai. It seems that Yurizaki doesn’t remember the Genesis coil. After she started using an official New Tesla Energy coil, its program forced her to forget anything about Genesis. Her father had to resort to programming her to follow illegal coils because he knew that would lead her to Easter Island. After confirming that Salba will still pay the reward to the first Collector to find the Genesis coil, Scorpion Cat Cassidy tries to get ahead of everyone. She only succeeds in activating the dozens of robots that were hiding, waiting to defend the glowing door. Ruwai uses his large robots (Ras Dashens) to hold off the defenders while Salba and Mabuchi lead the team into the door. The brother and sister team decide they need to stay and help Ruwai hold off the robots; Mabuchi agrees to give them a cut of the reward. Mabuchi reveals to Yurizaki that he brought her along because he suspects she’s key to unlocking and understanding the mystery on the island. His goal is to find a better possibility for his deceased wife. They reach the main chamber to find Loser and Elizabeth waiting for them. Loser and Elizabeth were waiting for Mabuchi and his team. Capture from the Funimation stream. Loser explains that his wife Sophia had been operating the transporter under the villain Haruka Seameyer’s supervision when it went wild and destroyed the island. Salba deduces that Loser’s real name is Julian Tyler, who was a promising young scientist under Shidou Yurizaki. Julian had been present for the accident and had somehow survived. Loser directs their attention upward, where they see that the transporter’s space/time distortion is still active. He then uses the power of his numbered coils to ensnare all of them in his memory of what happened. Seameyer had been one of Shidou Yurizaki’s most promising students, while Julian and Sophia had been Shidou’s employees. Together, they tried to solve the problem of a Dimension W teleporter sending inanimate objects just fine, while it killed anything living. Shidou deduces that the problem is the “mystery of life,” because Schrödinger’s cat. * He further deduces that a coil that could process the mystery of life would be perfect. Loser confirms this was the foundation for the idea of the Genesis coil. Seameyer took the lead in developing the Genesis coil. However, he did too good a job, and New Tesla Energy shutdown his research. In answer to Seameyer’s horror and outrage, Shidou says, “Sorry, dude.”** Seameyer, predictably, reacts poorly by taking over the facility and using all of the staff as guinea pigs to perfect teleporting living beings. Turns out he had already built the Genesis coil, but teleported living beings still died. He forces Sophia to operate the transporter by torturing her husband with a robot. Seeing teleportation after teleportation resulting in death restores Mabuchi’s memories back. When Yurizaki sees Mabuchi from the past arrive on the scene, a holographic projects falls out of the space/time distortion in the non-memory time. Seameyer teleported the (inanimate) projector from a surviving portion of the lab surviving in Dimension W space. He can’t return himself, and he’s missing an organic arm lost during the catastrophe. But he’s evil as ever and still wants to possess the Genesis coil. He explains how Julian is still alive: Sophia realized that the transporter reconfiguration was complete just as it became Julian’s turn as test subject. She teleported him and tried to instigate the disaster. Mabuchi took the Genesis coil from Seameyer and, faced with the need to keep it away from Seameyer but not let it escape the confines of the lab, he threw himself into the teleporter. He left the coil on the smaller fragment of the lab and re-materialized in our world without it. Loser (Julian) and Elizabeth are aghast at what Seameyer turned Sophia into. Capture from the Funimation stream. Seameyer sends a monster through the portal to attack them. In a fit of rage at what she had done to the transporter, Seameyer turned Sophia into a huge tentacled monster. He sends her through the teleporter to attack them. 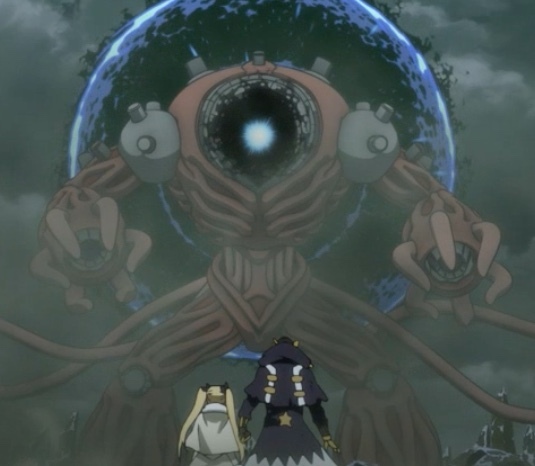 Ruwai’s brain connects to his artificial bodies via a network that leverages Dimension W to fight lag. I’d love to have one of those when I game online! I can’t say I “liked” it, but it was cute when one of the defending robots nicked Yurizaki’s tail. Apparently, it’s pretty sensitive, and she made one of her trademark squeaks when it happened. Mabuchi agreed to give the brother and sister digger team a cut of the profits for holding off the attacking robots. That was smart leadership, which stands in contrast to Salba’s version of using money to motivate (see What I Liked Less, below). While in (Loser’s) memories of the past, everyone was slightly out of focus or had hard-edges. I thought this was a neat visual representing hazy memories. Regardless of its other flaws, the animation continues to be fun to watch. The expressions and other character movements remain fluid, and I still think Yurizaki is adorable (Mira, not her father — he’s not my type — not that there’s anything wrong with that). Loser defeats Jason Chrysler off screen. Why show that conflict at all if we’re not going to get to see the end of it? Last I saw, Loser was in trouble during the fight — how’d he overcome? Was it really as simple as Jason’s suit broke first? That’s kinda dull. I get Salba wants to help Ruwai. That’s praiseworthy. Why, then, does he continue to smack Lashiti around? Why does she tolerate it? 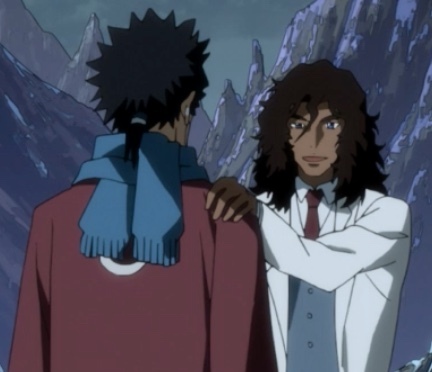 Why is Salba all smiles around Mabuchi? I feel like I have no idea who this character is or what his motivations are — and this is the penultimate episode! Shidou Yurizaki is the greatest mind (or one of them) in this story. It’s hard for me to believe that Mira switching to an official coil would result in her memory of Genesis being erased. Shidou designed her memory! The story hasn’t presented me with any evidence that when used as a power source, the coils exert control over memory systems. Maybe it was implied, but if so, I missed it. Even if it were implied, the idea that Shidou couldn’t find a way around it just seems contrived. Cassidy responds to financial incentives at the expense of others? Inconceivable! Capture from the Funimation stream. Salba is supposed to be a suave, sophisticated leader. That makes it really hard for me to believe that he would confirm to Scorpion Cat Cassidy that he’ll pay her twice the reward for the Genesis coil if she finds it first. The whole team was working together at that point; his confirmation all but guaranteed that some of the Collectors would try to strike out on their own. The smart thing to do, I think, would have been for him to say that all of them will receive the reward upon successful extraction of the Genesis coil from the island. Watching Mabuchi, Yurizaki, and the others watch the memories of the island’s demise reminded me of Mystery Science Theater 3000. Seeing this episode was like watching Mike (or Joel, whichever was your favorite!) and the bots make snarky comments about a bad movie. It didn’t feel dramatic to me at all. I mean, one of the first scenes we see is Sophia lecturing about the equation WE=pmc(2). Let me emphasize this: I watched the main characters watching a lecture in mathematics. That’s not drama! We also got to listen to Julian and Shidou theorize about why animals died when teleported. I could watch iTunes University if I wanted to simulate a classroom discussion. The only thing missing was a pop quiz that I could fail. How, exactly, did New Tesla Energy and Shidou expect Seameyer to react when they shutdown his research? They gave him no prior warning, they didn’t try to prepare him, and they didn’t give him any other projects. Of course he’d react with anger and everything that comes with it — like vengeance. Why would they do such a thing? Is this an example of poor characterization for Shidou, or did Shidou intend to push Seameyer off the deep end to ensure he would conduct further development around the Genesis coil? In other words, had New Tesla Energy already co-opted Shidou’s research by this point? By episode 11, I don’t think I should have these kinds of questions. Loser takes a moment to tell us that Seameyer’s curiosity became madness in that moment. Thanks, Loser, but I kinda picked that up from the plot. That statement of the obvious didn’t increase my confidence in the episode. Seameyer forces Sophia to run the transporter, and to keep her on task, he captures and tortures Julian. I don’t understand why Seameyer didn’t operate the transporter himself. Why go to the effort to make a sobbing woman, concerned for her husband, operate the controls (and taking the risks she’d make a mistake because let’s face it, her environment’s not helping her concentrate)? That made no sense to me at all. Does no character in this series understand how to motivate others? Yurizaki tells Mabuchi to get his act together. Great advice! Capture from the Funimation stream. Why does evil Seameyer wear eye-shadow, and where does he get it from his diminished world in the large lab fragment? Does turning evil mandate certain changes in personal appearance? Forgetting about make-up for a moment, where’s he get food and water? Those kinds of details are important to me as a viewer. Not knowing them, especially when the plot’s logic doesn’t provide any visible possibility of an answer, leaves me feeling frustrated. All of the test subjects were dead when shoved through the incorrectly configured teleporter, so how did Sophia know it was safe to teleport Julian? This episode made a big deal that without the Genesis coil, live beings can’t survive transportation. But the tentacled Sophia survives? How? I found this episode very disappointing because it was so confusing. In this review, I pointed out where I thought characters made decisions that I couldn’t understand; where things happened that had no plot justification; where the technological rules of the world established so far didn’t apply for reasons that were not explained. Any one of these things has convinced me to stop watching a series. 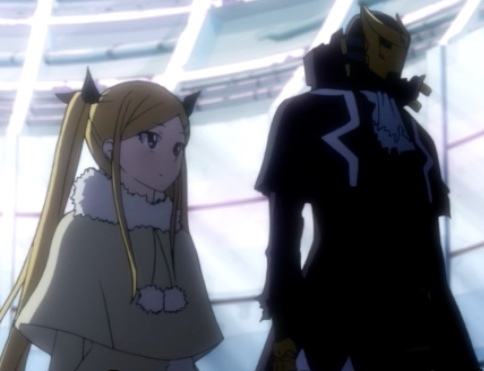 I’m still watching Dimension W for a couple of reasons. First, I find Mabuchi (when he’s not trying to slap or kick or otherwise harass Yurizaki) to be a sympathetic character. He’s powerful and confident, yet events beyond his control cost him his wife and (in his view) his honor. That’s tough to recover from. Second, I really enjoy Yurizaki’s character. She’s unfailingly positive and supportive, even when Mabuchi doesn’t deserve it. Plus, I still think her squeaks are cute.